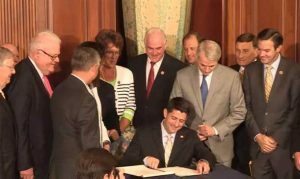 Congressman Pat Meehan looks on as Speaker Paul Ryan (R-WI) signs the Comprehensive Addiction and Recovery Act to send it to the President’s desk on Thursday. President Barack Obama was expected to sign four bills authored by Rep. Patrick Meehan (R-7.) after all received broad bipartisan support in both the House and the Senate this week. Three of the measures were included in landmark legislation taking on the opioid abuse epidemic. The Comprehensive Addiction and Recovery Act passed the House in early July and was approved by the Senate Wednesday evening. Meehan served as a member of the joint House-Senate Conference Committee tasked with crafting a final opioid abuse legislation package for approval by both chambers. Meehan was on hand this morning as the legislation was enrolled by Speaker Paul Ryan today in a ceremony in the U.S. Capitol. The ceremony can be viewed here. A fourth bill, the United States Semiquincentennial Commission Act of 2016, lays the groundwork for a national celebration of the 250th anniversary of the Declaration of Independence and the founding of the United States. The legislation creates a commission to plan for nationwide festivities similar to the United States Bicentennial celebration held in 1976. 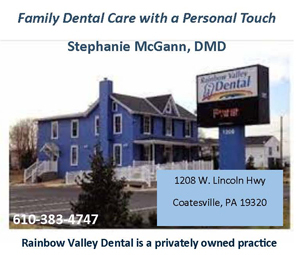 The commission’s activities will be centered in southeastern Pennsylvania. Meehan spoke on the House floor in favor of the legislation last week. • The John Thomas Decker Act¸ introduced by Meehan earlier this year, will help will help prevent addiction among young athletes prescribed painkillers for injuries suffered on the playing field. • A provision making permanent the authorization for federal support for specialized veterans’ treatment courts. Meehan has long championed veterans’ courts and introduced legislation to permanently authorize federal funding for the courts. • Authorization for Medicare prescription drug plans to establish drug management programs. The policy ensures that seniors have appropriate access to medications while aiming to reduce misuse and abuse of prescriptions with a high potential for psychological or physical dependence. Meehan introduced similar legislation in the House in March.